I just finished seeding 95% of my seed pots. I have a few left over; maybe I'll start some Silver Queen or Bantam in them. thanks for pvc reply. We have those cabbage worms also. We don't have frosts. 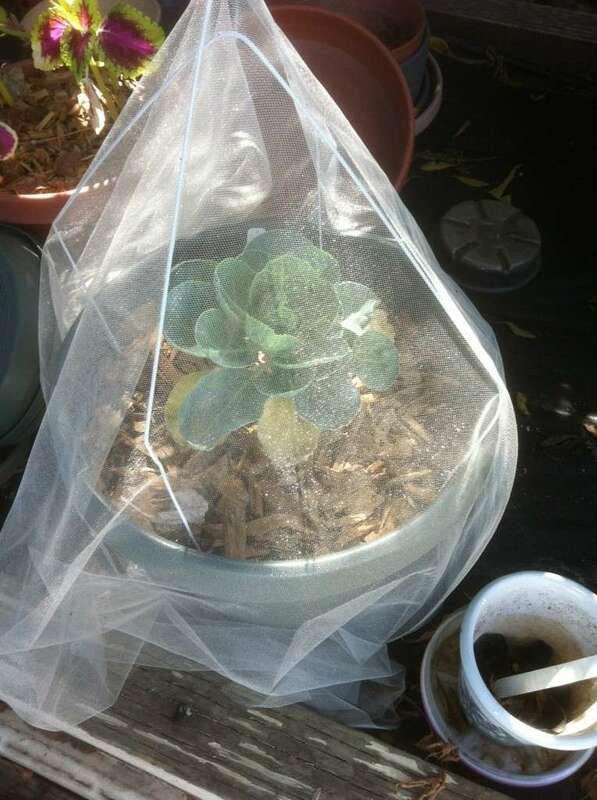 I used some re-purposed metal coat hangers for tulle over brassicas last summer. NOw - that's more my speed. I'm not sure where to get metal coat hangers any more. Mahalo. My husband has the cleaners wash his better shirts, so I have a decent supply. Someone mentioned that some blue collar businesses have uniforms that are commercially laundered. You might try to locate a couple businesses where they toss the hangers rather than return them to the cleaners. A picture of one of the blooms (at night, of our dragon fruit blossom). Trying to figure out how to up load photo. I moved the winter tolerant starts out of the greenhouse and into the garden to free up the pots etc. for the next wave of seedlings. No matter how tempted I am, I'm not planting anything that frost can kill because if I do it's a GUARANTEE we'll have a heavy frost and then you gals will be mad at me, LOL! I am loving the greenhouse for starting plants. They get the sunshine they need. I get to putter around and enjoy the warmth and the sun and they grow so much faster and better than indoors. 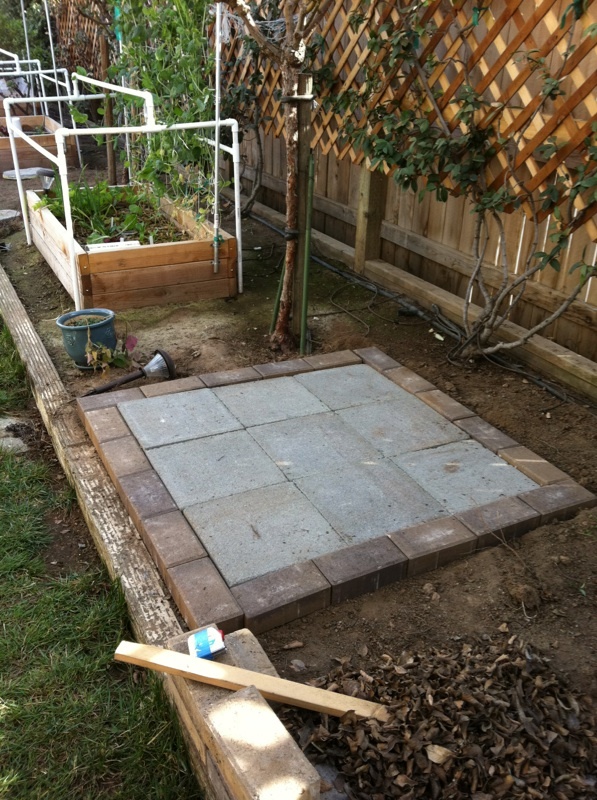 I just built a 4 x 4 x 4 Berkeley hot compost pile this afternoon. My woodchips pile makes it so easy to do. I have a horse in one pasture and 20 cows in another so I grab about 3/4 of a wheelbarrow load of chips and top it off with manure, water it all well as it's bone dry from our weather and it's ready to roll. Sounds like you had a productive day. 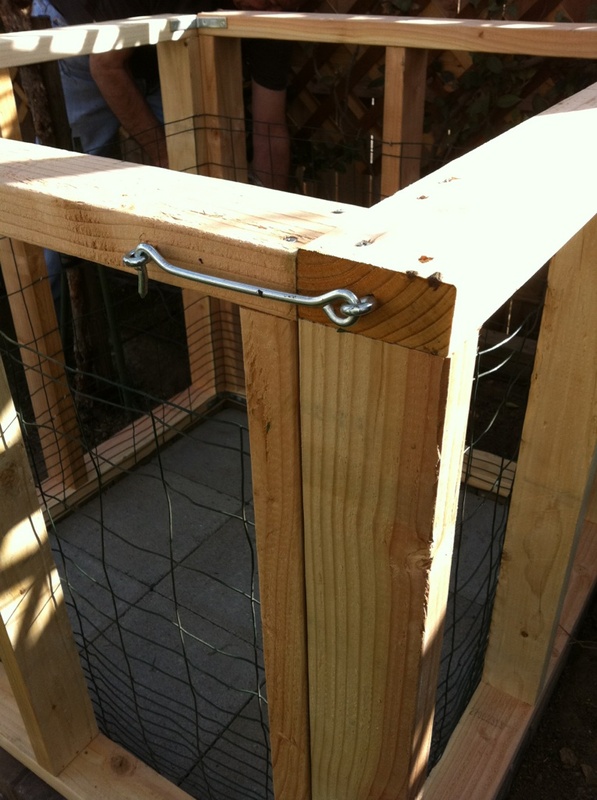 DH built the frames for my 3 x 3 x 3 compost bin and started attaching the wire mesh. I can't wait to build a real Berkeley compost. I am afraid I don't have enough dry leaves and I don't want to use the pure wood chips. The wood chips and shavings I used in my 3 compost piles did not completely decompose. I saved them, though, to put into my new cage, along with new leaves. Did you layer the 3/4 wheel barrow of chips and the manures? That is, you repeated the process up to the top? I have 5 flats of 2" seed pots and yogurt cups, and a 6th half way done. I was thinking about putting them in the green house and moving the peppers outside. If a freeze is predicted, I would put the seed trays indoors and the peppers back in the green house. I wish I had that lovely roomy house of yours!! So, it's okay if I direct sow bok choy, chard, etc. in my new sunny 1' boxes? DH also cut and drilled 3 more 3" worm tubes so the 4 largest ( 2' x 4') boxes will have one. Rain expected at dawn Wednesday morning so tomorrow I will wrap my poor burned face and make sure all the tools are put away, etc. Boy we really need rain, I hope we really get it this time. Seems every time they say chance of rain this year it doesn't. Once I get the N to C ratio right (which I'm hoping will be at the 3/4 woodchips 1/4 manure) I moistened it all and mixed it all up together so it will react all the way through the compost. It all gets mixed the first turning anyway so layering I think is just to make sure your materials are balancing out. I watched it this weekend as well and now I can't wait for the snow to disappear so I can get started on my compost pile again! So, rain or no rain? It barely sprinkled an hour or so ago. I could count the drops as thy hit the plastic on the green house. 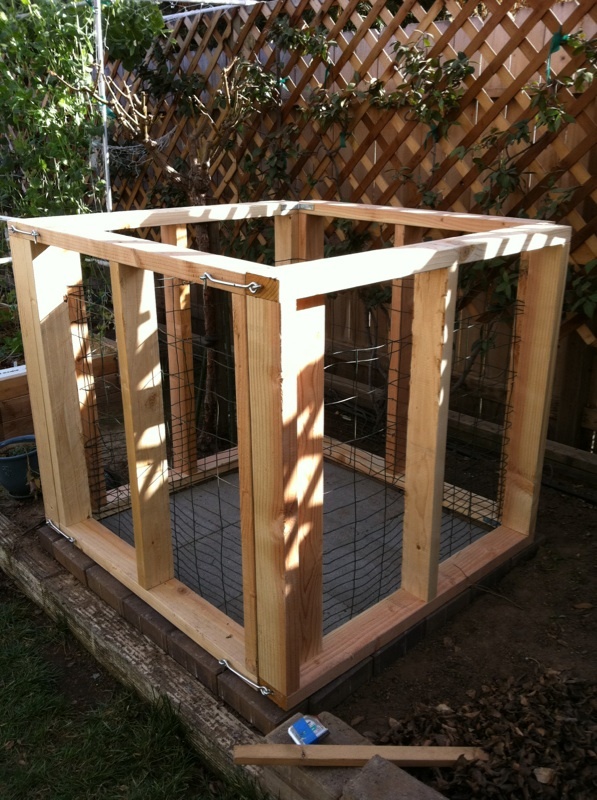 Today I got the new compost cage pad set and we put the new cage on top. Still need to add the upper section of cage wire, then line with fly screen. Rain rain don't go away! We need you here another day! It was pouring a few minutes ago. A welcome change. My 5 year old couldn't wait to get outside in her rain boots and jacket. Sanderson do you mind if I ask why you don't put your compost directly on the dirt? I have to cage mine in eventually due to my chickens tearing it apart and spreading it everywhere but it is on the dirt. Hi there! I missed your post too! I check in on my days off which are Wed and Thurs. I work at the hospital downtown and unfortunately I have weekend shifts. I've never even been to the Vineyard Market yet because I'm working. I've been looking at your pics and really like your setup! Where do you buy tulle? Wal Mart or Joann's maybe? My seed starter kit arrived this week and I think I'll spend this rainy day getting everything started! Keeper, Well, that's a good question. Several reasons, and this is also just an experiment. 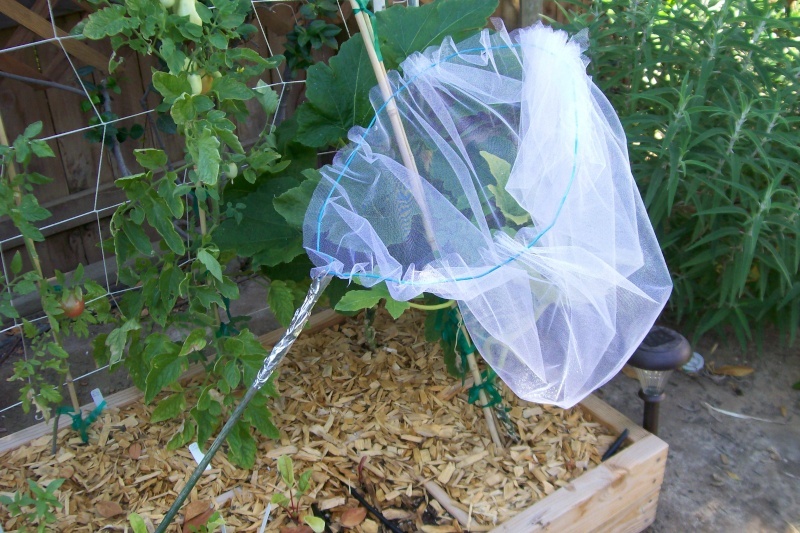 I had a circular 3" diameter cage for my first 3 homemade compost in 2013. I wanted one that could be opened on one end for proper turning. This new spot barely fits in between the roots of a tree and a 3' stalked rose bush. The dirt is humped and I wanted to build up a flat surface so I could fork / shovel material but not get the dirt. The liquids will still easily seep between the pavers and I bet those 2 plants will love it! Hi Mary, I've never been to the Vineyard because I'm a late riser. (retired) Have you ever been to the Clovis Farmer's Market? For our get together, Wednesday and every other Thursday are both good for me. I bought the tulle (20 yards?) at Joanne's. Happy Seeding. As I promised myself, I would tackle the master walk-when it rained! I am SOOO happy that you are getting rain. I hear one foot snow in the Sierras. Bring it on. I can't complain about the 1/2 inch of rain yesterday!! The vineyard farmers market is also open on Wednesday afternoons from 3-6 so no excuses you two! The market I love the most is the late spring/summer Clovis farmer's market. Lots of vendors and live music. I ask the growers whether they spray or not and go from there. I can usually get the best prices there as well (especially blue berries) because there is more than 1 vendor selling the same thing. The only drawback is the oppressive summer heat. Wednesday 3-6 PM. Thanks for the info. I love the Clovis market, but I like to wait until the sun starts to go behind the buildings. And there are all the antique shops!! It's down to 36* right now. I'm trying a lamp in the little green house tonight for my little seedlings! The Ching Chang bok choy has sprouted after 7 days. I hope the over-wintered pepper plants make it out doors tonight. I'm going to have to rearrange things again. I have a layer of ice in my bird bath and fountain base so we were colder than expected. I will have to cover my seedling trays tonight as they're in the main part of the greenhouse. I have a squash seedling that just got started and he looked okay this morning but I don't want to push it! Just to make you mainlanders jealous. I have picked the first of our sugar snap peas. (I don't recall which kind). With the few vines they are currently just enough for snacking for whoever is working in the garden. I plan to plant a bunch more because we should have some relatively cool weather for a while. Our first (Susan's) zucchini produced a huge squash and then got attacked by lots of mildew and other white stuff and keeled over and died. I have purchased two more starts today for Susan (my new gardener cohort) to put in. We work together Monday, Wednesday, Friday mornings from 7 to 7:30 and get a lot accomplished. She has to go to work and I have to walk and attend meetings shortly after and it is remarkable what a difference this has made for our garden. She is new to gardening and her enthusiasm is infectious. You have a gardening buddy1 That has got to make it more fun but with only half the work. I gave up with this weather. Brought the budding over-wintered peppers back into the hot house; and the 6 trays of seedlings into the house. I bought a light for them but I think I need a second one. Everyone braced for the rain, then freeze predicted end of the week? ?